Fed Chairman Jerome Powell asserted the central bank’s independence in remarks to Democratic lawmakers, telling them the Fed doesn’t consider political pressure in any way, according to 2 people in the room for the closed-door event, Bloomberg news reported. Powell’s appearance Thursday night at a Democratic retreat came as many of the lawmakers gathered there have raised alarms about the Fed’s independence in the face of President Donald Trump’s frequent criticisms of the central bank. Powell declined to discuss the president, according to the people, a comment that was greeted by applause. The chairman told the lawmakers that interest rates are at about the right level given current economic conditions and that the benefits of US economic growth haven’t been as widely spread as the Fed would like. Sydney property prices face “further downward pressure” due to a large ongoing apartment pipeline as risks to Australian households have risen, the central bank said. In its semi-annual assessment of the financial system, the RBA cited the danger of a “sharper downturn” in the global economy. It said while banks’ profits remain healthy, increased scrutiny and weaker property and housing credit meant “greater-than-usual uncertainty” about their outlook. Australia is in uncharted territory as property prices in Sydney and Melbourne, accounting for almost 40% of the total, tumble while unemployment and interest rates remain low. In addition, the surge in the housing market between 2012 and 2017 means only buyers late in the boom are at risk of having a loan worth more than their home. Brexit is on course to be delayed until the end of October under a plan to avoid a chaotic no-deal split, risking 6 more months of political uncertainty over Britain’s ties to the EU. The blueprint hashed out during 6 hours of talks in Brussels allows the UK to stay in the bloc until Oct. 31, with a review of progress to be held in June. British Prime Minister Theresa May accepted the offer and must now sell it to skeptical members of Parliament in London. The pound was unchanged on the news, as investors had priced in a delay. Diplomats were quick to point out that this might not be the last extension Britain is granted and Tusk didn’t exclude the possibility. The Oct. 31 deadline is a compromise and the UK can leave sooner if Parliament ratifies the divorce deal. May asked for a short delay until the end of June, but Tusk proposed a delay of as long as a year. At the summit on Wednesday, French President Emmanuel Macron took a hard line, and a leading role in the discussions, pushing for a shorter extension and tougher conditions to make sure the UK can’t sabotage EU business on its way out. 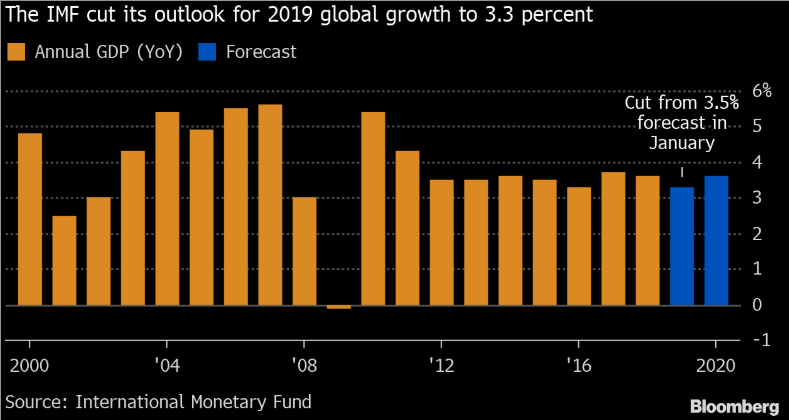 The world economy will grow 3.3 percent this year, down from the 3.5% the IMF had forecast for 2019 in January, the fund said Tuesday in its latest World Economic Outlook. The 2019 growth rate would be the weakest since 2009, when the world economy shrank. It’s the third time the IMF has downgraded its outlook in 6 months. The global volume of trade in goods and services will increase 3.4% this year, weaker than the 3.8% gain in 2018 but reduced from the IMF’s January estimate of 4%, the fund’s report showed. Global economic growth will recover in the second half of this year, before plateauing at 3.6% from next year, according to the Washington-based fund. A series of encouraging developments have boosted optimism about the world economy in recent weeks, including the decision of the Fed to put interest-rate hikes on hold and encouraging data from China’s manufacturing sector and the US job market. The fund cut its forecast for US growth to 2.3% this year, down 0.2 percentage point since the IMF’s last global outlook in January. The downgrade reflects the impact of the partial government shutdown that ended in January, as well as lower-than-expected public spending. The fund upgraded its US forecast next year to 1.9%, up 0.1 percentage point, on the Fed’s shift to a more patient stance on interest rates. The IMF slashed its outlook for the euro area to 1.3% this year, down 0.3 point from 3 months ago. Growth is expected to be softer in several major European economies, including Germany, where weak global demand and tougher car-emission standards have hit factory production. Weak domestic demand and high sovereign-debt spreads have dimmed Italy’s outlook, while street protests in France weighed on growth, the fund said. Forecasts for Chinese growth was raised by 0.1 point to 6.3% this year, while that of Japan was lowered by 0.1 point to 1%. As expected, Singapore’s central bank kept its monetary policy settings unchanged on Friday, striking a dovish tone as it sees the economy growing below potential. After tightening policy twice last year, the MAS, which uses the exchange rate as its main policy tool, left the slope and width of the currency band unchanged, as well as the level at which it is centered. The stance is “consistent with a modest and gradual appreciation path” of the currency band, it said in a statement on its website. The government is projecting growth in the export-reliant economy will slow to just below the midpoint of the 1.5 to 3.5% range after a 3.2% pace in 2018. A separate report Friday showed gross domestic product grew 1.3% in the first quarter from a year ago, lower than economists had projected. The MAS sees growth at “slightly below potential this year, following two years when it was above trend.” That implies a softer inflation picture as well, allowing policy makers to stay on hold. According to Bloomberg news, Uber Technologies Inc. has spent more than $1 billion on autonomous vehicle technology to compete with giants such as Alphabet Inc., Apple Inc. and General Motors Co. The company listed Google’s Waymo, General Motor’s Cruise, Tesla Inc. and Apple, among others, as competitors in self-driving. Investors looking to invest in this space can consider the Self-Driving Cars US portfolio on iAdvisor, which has been one of the top 10 performers over the past month, returning a decent 5.5% from a month ago as of Thursday. USDSGD gained to a 1-month high, climbing to 1.3580 earlier following MAS’s decision to keep its currency policy settings on hold as expected. The MAS had struck a dovish tone as economic growth cooled and inflation remained low. Further SGD weakness could drive the pair higher to the 1.3614 resistance level, which has been the upper bound of its range over the past 3 months. AUDUSD fell earlier today, giving up 0.6% to 0.7116 after the release of the RBA’s financial stability review. The central bank cited the housing market as a risk to the domestic economy while signaling a slower pace of global growth. Investors will now focus on China’s trade balance data, due later today, for further direction. USDCAD continues its consolidation between 1.3400 and its 50-day moving average, currently at 1.3301. The pair has struggled to find meaningful direction overnight amid weaker crude oil prices. However, the overall longer-term trend of USDCAD continues to remain to the upside, as it remains comfortably above its 200-day moving average of 1.3201. USDCNH was little changed Friday, with the US and China apparently inching closing to a trade deal. The pair is currently testing its 50-day moving average for only its third time since end-December. USDJPY looks poised to test the key 112 resistance, after the pair rose by its most in 2 weeks last night. However, the focus over the near term is on whether US data and corporate earnings can further heighten expectations for a recovery in pace of growth, coupled with the first meeting between US and Japan trade negotiators next week. GBPUSD remained little changed earlier today, after news on Thursday that the EU has allowed the UK to remain in the region for a bit longer til Oct 31, as compared to the earlier scheduled Apr 12 Brexit date. A decline below GBPUSD’s 200-day moving average, now at 1.2971, is likely to drive the pair lower towards the 1.2700 region.